Self-contained, shelf-stable meals plus heater. This Case contains 12 complete MRE meals, ready help you survive and thrive on your next mission. Each individually-sealed MRE contains main entree, side dish, bread, spread, dessert, beverage powders, seasonings, eating utensil, chewing gum, toilet paper and more. Very lightweight and built strong to handle a rough ride in the bottom of your rucksack. Included heating element can be used to add warmth to the main entree, but when necessary each MRE can be consumed cold. Ultra-durable and delicious, easy to pack and take anywhere. 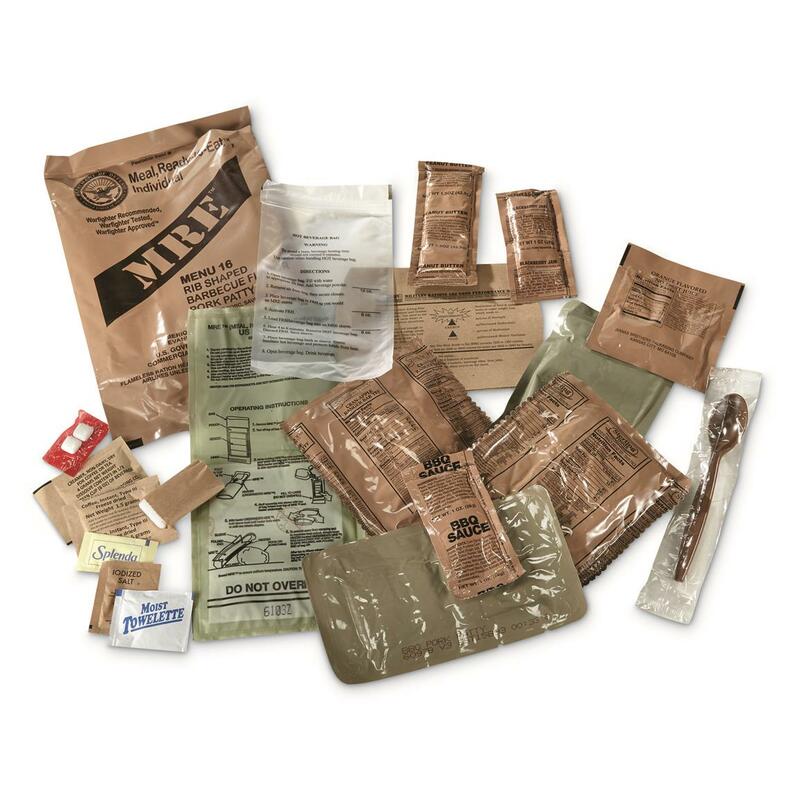 All components of each MRE are wrapped in thick plastic. Meals are pressure-treated, heat-treated, and vacuum sealed. No air means each component can take significant force without bursting, as well as waste no space during packing. Typical weight (depending on contents) is 18 to 26 oz. with only 5-6 oz. being packaging. Meals are ready to eat right out of the bag. Eat up, get yours now! 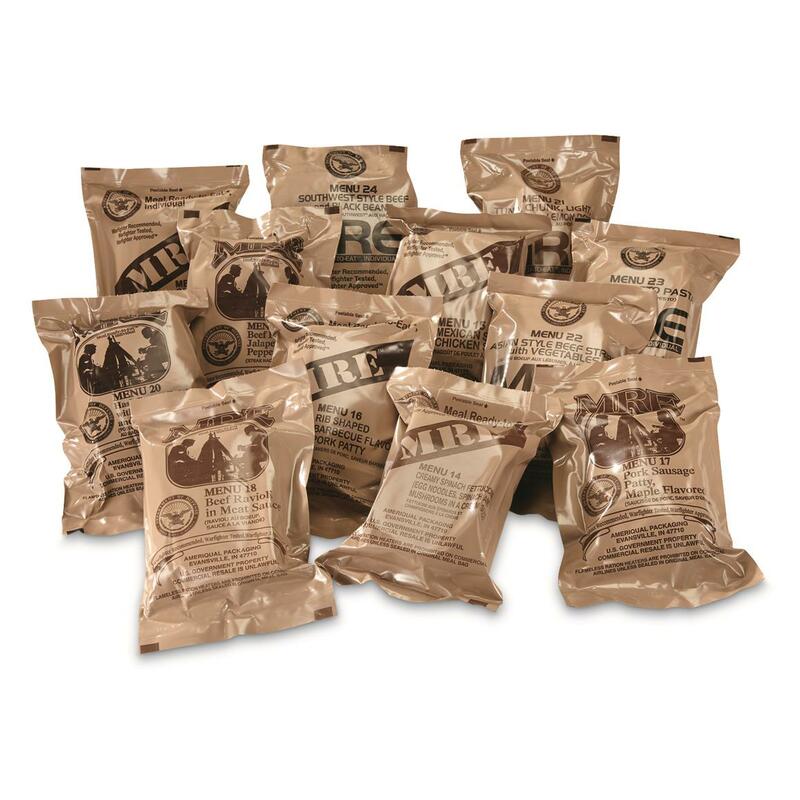 U.S. Military Surplus Complete MRE Meal Assortment, 12 Pack is rated 4.8 out of 5 by 4. Rated 5 out of 5 by jwyatt from Worth every penny I received A menu. Love having MRE's for my backpacks, hiking and hunting. Rated 4 out of 5 by Hello from Happy... but! Authentic us military mre’s! I’m happy I bought them and sportsman’s guide packed them into a box together which was nice. Dates 10/15/18 boxes 02/19 inspect date. Good but Not great. Boxes are in great shape and stickers light which is good. My biggest gripe and I know it’s not in writing and there’s no promise on which menu but I was really hoping that buying 2 I’d get both menus not the same! All and all good buy and I’ve tried one already and there pretty good! Rated 5 out of 5 by henry9th from Great These m.r.e. cases of (12) are perfect! They are in original sealed box that manufacturer shipped in. Also with temperature inspections code on box . Code on my is good. I figured out mine were made in 2016/Feb. Tried one out and it was great. At $6.74 an m.r.e. ,saved money , along with s.g. free shipping. Rated 5 out of 5 by Mike from Very good value I have purchased MRE’s from SG for years. Always comes fast, at a fair price and I have never had a problem. I use these hunting , fishing and backpacking. At the end of the day it is 5 Star cuisine to have. I was glad to get chili with beans, this is some of the best chili I have had. I sampled that meal first thing and everything in it was very good.